Carol Vernon has been in commercial and industrial real estate development since 1976. She received her Master of Business Administration from University of California at Los Angeles. Carol began collecting photography in the mid 1970’s alongside her late parents, Marjorie and Leonard Vernon. Bob Turbin is a native of Los Angeles, and he received an architectural degree from California Polytechnic State University, San Luis Obispo. Bob incorporated his creativity and his organizational ability in residential real estate development throughout California for nearly forty years until his retirement in 2008. He has been involved in collecting photography since the mid 1990’s. The Vernon Collection of 3500 images was acquired by the Los Angeles County Museum of Art in 2008. We spoke on August 27 at Paula's home in Sherman Oaks. CV: I was in my mid-20s when my parents started collecting. I did not live at home but I worked with my father. So every time they went to look at something, I went with them. I was very involved but I did not grow up with this. BT: You were with your parents when they made their very first acquisition. PE: What was their very first acquisition? CV: They bought 16 images at once. They acquired a Heinrich Kühn and a group of Herbert Ponting’s photos. They were all 19th century pieces. PE: That’s a commitment right out of the gate. CV: Yes, but I don’t think they had any idea that that was the beginning of a collection. PE: Did they collect other art? CV: For a while they collected paintings and graphics, mostly Latin American, and some ceramics, but the one collection that really took off was photography. PE: What do you think drove that interest? CV: I think my father had always been interested in photography. He had a darkroom. He took pictures. He was interested and knew about photography as an art form from pretty early on. Initially he was the driving force but my mother loved it. PE: Did it explode from there or was it more of a slow process? CV: Once they started looking and paying attention and learning it was a pretty steady process. PE: What was it like in those early days? CV: In the early days, there were very few dealers in LA. There were some people in New York but it was a pretty small society. It was very different then because everybody knew one another. They went to auctions in New York. There wasn’t an online presence. There were very few bids by phone. It was pretty much the dealers and the collectors all in one room and they knew one another so there was all this jockeying. It was fun. It was pretty exciting. PE: Photography has grown exponentially since then. CV: They witnessed a lot but it’s changed. About a year or so before my father died, it was really clear to him that silver gelatin and conventional photography was changing. He was not interested in collecting ink jet prints or digital prints. He was pretty much old school. PE: So everything in the Vernon collection is silver gelatin or platinum? CV: No, they did collect color, but traditional process color. They had a point of view of what photography was but the definition of photography was changing. The internet also changed things. There are more photographers now than you could ever hope to know about and that number keeps growing. While my parents were collecting, it was a more finite group. PE: Was there a driving principle behind the point of view? CV: No, and that’s why they had a very, very diverse collection. The main thing for them was they both had to like it and want to live with it. They did not own any Diane Arbus or Joel-Peter Witkin work--the kinds of things that are rather voyeuristic with a difficult point of view. I think they felt it was somewhat exploitive to look at people that way, so they didn’t want that in their collection. BT: The Santa Barbara Museum had a show in 1999 entitled An Eclectic Focus, which is a very good description of the way they collected. There really wasn’t a singular focus. It just was what really appealed to them. That’s how they collected. PE: Those seem like perfectly reasonable rules. CV: It certainly does to us because that’s what we do. BT: It could be a lot easier, as a collector, to have a specific focus, to collect birds or Japanese or Latin American photography because so many things get presented that you can more easily say no, that’s not my area of focus. CV: My mother collected Brooklyn Bridges. That was her personal collection, and all the dealers knew. So anytime there was a Brooklyn Bridge available she’d get a phone call. PE: At some point you two took the collection to the next phase. CV: It was always very clear that my parents wanted the collection to stay together. They had hoped it would stay in Southern California, or at least in California. When my father died, it was like, okay now we have to finalize that. It was not an easy task. We couldn’t afford to just donate it because of the estate taxes. It was hard to find a museum that was financially able to buy part of the collection. We were fortunate that Wallis Annenberg stepped up and gave LACMA the money. We were able to do a gift/sale that went to the museum. That’s really what my parents wanted. PE: What can you tell people about how that process at LACMA works? I know people are curious about what happens with collections. CV: It is not easy to get a museum to take a collection, number one. We tried to set some conditions such as a specific number of photographs would always be on exhibit or that there would be a certain number of square feet of space dedicated to exhibiting photography. We were not successful. BT: We also wanted to keep the collection together. There were museums that wanted to cherry pick. You know, take only what they needed to fill in their collection and leave the rest. CV: Donating a collection seems like an easy kind of thing. The donation part is easier than actually getting money for it. That’s really difficult. There are a lot of decisions to make, and agreeing on the value of things is a major component of a gift/purchase. Again, if it hadn’t been for Wallis Annenberg it wouldn’t have happened. PE: Did LACMA put that together? BT: Richard Rosenthal, photography collector and member of PACLA and the Getty Photography Council along with his wife Strawn, did that. He knows Wallis. 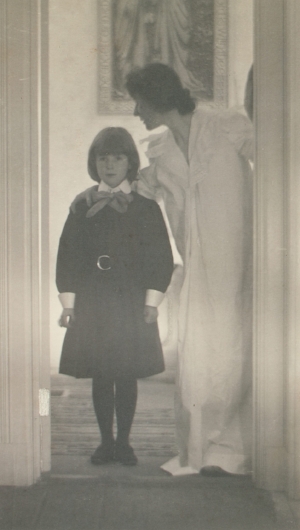 She was going to make a significant donation to the museum and Richard introduced her to the concept that the acquisition of the Vernon collection would put LACMA’s Photography Department on the global map. She likes photography and agreed to do that. If it weren’t for Richard this wouldn’t have happened. PE: There been two exhibitions of the collection at LACMA? CV: The first was in 2008 and Britt’s show in (2013-14) which was fantastic. [Britt Salvesen is LACMA’s current Curator of Photography] She used the material in a completely new way. It was very exciting. BT: She had space around the images and there were small groupings so you could focus on specific images and not be distracted by large clusters around you. CV: Some of the pictures she put together and some of the things she chose to use and others she didn’t choose to use were surprising. I think she did a brilliant job with it. BT: She didn’t make it a show of the iconic blockbuster images. I think there were about 150 images. She pulled some obscure work along with some very well known pieces and was not afraid to put them together. You start to see pairings that you wouldn’t have seen otherwise. A number of years had passed since the collection went to the museum and we hadn’t seen a lot of the images for a while, so it was fun to go back and visit old friends. We appreciate it when it’s well done. PE: Why do you think some pictures become famous and others don’t? I know you have many that are big names, well known, and others that are not, and I wonder if you have any thoughts about why. CV: I think there must be something that is a common thread for all of us to relate to in the kinds of pictures that become iconic. What that is or how it works, I don’t know. What’s interesting is one of the images in our house that gets the most attention and questions is the image of the Ferry Building in San Francisco, an Ira Kahn. He’s not a well-known artist but that gets the most attention. BT: It’s dramatic and people can relate to the image. Maybe that has something to do with it. It may also be that over time for one reason or another an image gets publicized so people become more familiar with it. That starts to create that iconicism. CV: Oh I think it really can. For instance, the George Legrady piece that was in that show was one that I had seen at my parents’ house many, many times. Couldn’t figure out what the heck it was doing there because it was not on photographic paper. It always intrigued me but I didn’t do anything with it. This past year, we met George and as soon as I saw some of his other work I was able to put it together. My guess is that people are beginning to know George and his work and it’s registering. We’re catching up to his work. PE: Not everybody who goes to a big show like that at LACMA has been looking at photographs for years and years and can pick out the famous ones. You never know who is going to be attracted to what. It’s nice to know that she dug deep. gertrude käsebier, blessed art thou among women, 1899. BT: In looking at that show we realized that not doing a show of all blockbusters, by mixing it up with some lesser known artists, she had the ability to promote photography that way. It was refreshing from our perspective to know that it had the potential to be seen and to generate a lot more interest in photography. The interest level from visitors at the museum was very high. PE: Is there some image that stands out to you from the early days of your parents collecting that made an impression on you? CV: I always think of the Heinrich Kuhn, which was one of the first ones that they purchased. It was a child on the hill with a great big hat. It was a very important piece to my mother because it reminded her of her as a little girl. It was always a gorgeous picture. That’s one that comes to mind. BT: The other one was Blessed Art Thou. It was an image of a woman at the front door with a younger daughter and I always envisioned that as being Carol and her mother. PE: You two have continued to collect beyond what your parents established. What is your own philosophy? BT: I think our philosophy is much like her parents’. We have to agree. It has to be something that we want to live with and there is no particular theme. It’s kind of the extension of the Vernon Collection. They were very good mentors to me. I came into the picture shortly before Carol’s mother passed away and got exposed to the collection in helping with presentations to people who were coming to the house to preview. PE: They shared their collection a lot and you do the same. CV: They felt that they were just the custodians of this and that the more people that saw the work the better. It was not something that they wanted to hide away, which was why they wanted it to go to a museum. That’s my feeling; too, that this is to be shared. We get a great deal of pleasure from sharing it. PE: Why do you think photography is important, why should we care about it, why should we look at it in a museum, why should we collect it? CV: If it doesn’t speak to you, if it doesn’t impact you then it doesn’t have any value. I think it’s something you react to that informs you that moves you in some way, which is why everybody collects something different. BT: It’s gotten to the point where photography is no different than any other art form. It has the same value emotionally. PE: Is there anything else you want talk about? CV: There is one thing. My parents had an amazingly wonderful life because of their collection and because of the people they got to know by collecting. I feel really fortunate that we got part of that and that we have been able to enjoy the same thing. It’s a whole community and it’s wonderful to be part of that. PACLA is part of that community and it’s exciting that we took this institution out of the museum and improved it and grew it and that it continues to grow.